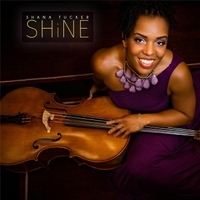 SHANA TUCKER Women's Work DEBUT "A SisterCentric Collective" ♪ DwighTrible Presents: "Summer" Concert Series @ STAGE Fri., Jul. 21st 9PM ¡LIVE! "Featuring Steph Johnson - guitar/vocals, Melonie Grinnell - piano/keys, and Rob Thorsen - bass (San Diego); Shirazette Tinnin - drums/percussion (NYC); and Shana Tucker - cello, vocals, guitar, (NC)." "I'm returning to The World Stage in historic Leimert Park, this time with my SisterSledges! Women's Work is a colllective of composer-artists playing cello, guitar, piano, drums, bass + vocals...original compositions and arrangements from a (primarily) female perspective."